Carte-de-visite portrait of Thomas Bassnett (b. 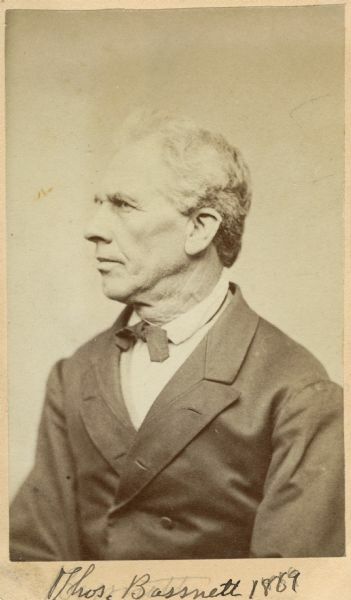 1808, d. aft 1885), American meteorologist. Handwritten inscription at bottom of card reads, "Thos. Bassnett, 1869." Photographer's credit on back reads, "Bowman's Art Gallery, Ottawa, Ill." From album of portrait photographs collected by Lapham depicting scientists and artists, ca. 1860-ca. 1875. Images include portraits of geologists, botanists, sculptors, and authors.